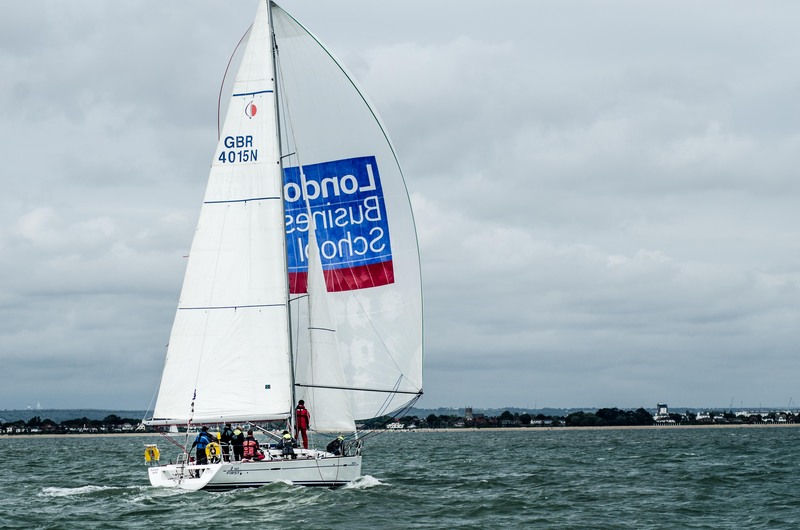 London Business School, the 2014 Sunsail MBA Global Sailing League champions won the Cranfield regatta on the 9-10 of July, in the Solent on the South coast of England, to end a losing streak that’s lasted since they won the same regatta in 2014. LBS won with three first places and two seconds. For the first time since they have competed with them, they finished ahead of the main Skolkovo crew. The Russian team have dominated the league since The Global MBA Trophy in April 2015. Skolkovo came second on the Solent, winning one race and coming third in two. Third place were Henley, who also won one and came third twice. It was a windy weekend on the Solent, with the committee banning spinnakers and enforcing a reef in a number of races, and the winning boats played it safe and poled out their genoas. There were 13 boats competing from 8 business schools. The regatta has been organised by Cranfield since 1991 – missing only a single year, and this was the 25th edition. The event started off with some very physical shore games, including a seated tug of war and the “shell game”, played by the teams dressed in pirate dress at the Friday night barbecue. Saturday night was a slightly more sedate affair, at the dinner at the Cowes Yacht Haven. It culminated in a Ceilidh – folk dancing guided by a live band.